Do you believe, your favorite websites could be using your browser For Crypto Currency Mining? You could end up higher electricity bills and slower computer. Your browser could be using your computers' power for mining crypto currency for stranger. And you never thought about it. If computer suddenly starts using 100% of CPU and system memory or starts heating for some specific website. You may be the victim. Some Google Chrome extensions also caught mining on the users PC. There is easy way to check the websites. Who is mining http://whoismining.com will help you to find the if the website is reported for crypto currency mining. 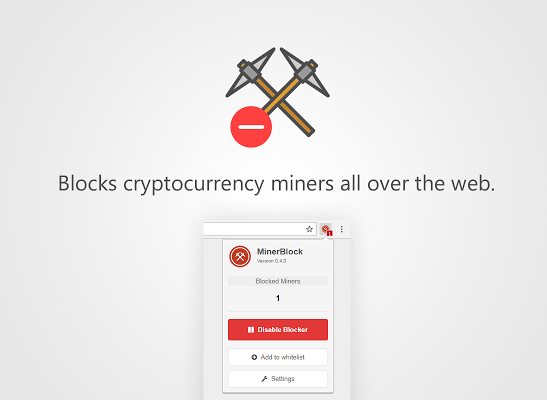 The Miner block extension for Google Chrome and Coin Block for Mozilla Firefox browser will monitor every website you visit and notify you if the website in behaving strangely. You can also try the No Coin extension for Chrome. Extension works similar to the ad blocking extensions. It scan known / reported domains against the mining script and block them. The other way is detecting potential mining behavior inside loaded scripts and killing them. Some hijacked sites have also used for mining without the site owners intention. Its really strange but true. All that you can do is protect yourself.